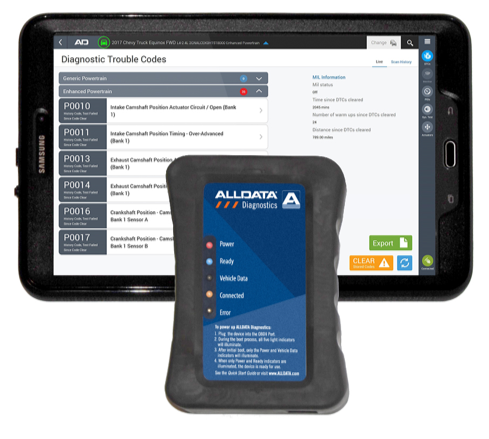 ALLDATA Diagnostics turns a tablet into a professional-level scan tool with direct ALLDATA access (requires a subscription to ALLDATA Repair® or ALLDATA Collision®). It includes unlimited pre- and post-scans with no per-scan charge, plus free software and data updates. There’s not even an upfront charge for the equipment – it’s all included in one low-cost subscription. Having ALLDATA Repair or Collision built into the ALLDATA Diagnostics scan tool system means that technicians have direct access to the industry’s leading source for unedited original equipment manufacturer (OEM) repair information (without punching out to a separate browser or app). The ALLDATA database of factory-direct diagnostic and repair procedures includes more than 38,000 vehicles – 95 percent of all vehicles on the road today. ALLDATA Diagnostics helps shops limit liability by providing access to OEM-direct information, integrated with Diagnostics’ full-system, pre-and post-scan reports for proper documentation. Most insurers require participating Direct Repair Program (DRP) shops to use OEM-direct information such as that provided by ALLDATA to ensure safe, accurate, and reliable repairs. ALLDATA Diagnostics turns a tablet into a professional-level scan tool with ALLDATA built-in and unlimited pre- and post-scans. Visit alldata.com/diagnostics for more information. Note:Editorial attendees wishing to meet with a senior ALLDATA representative at SEMA or to schedule an advance phone interview, please email sheryl.bussard@alldata.com or call directly at 888.892.2332. ALLDATA®, an AutoZone company, is the leading provider of unedited OEM (original equipment manufacturer) information for the automotive repair and collision industries. Founded in 1986, the Elk Grove, Calif.-based company serves loyal subscribers worldwide who rely on ALLDATA for OEM-accurate automotive service and collision repair information, shop management software, training, and customer relations tools. ALLDATA’S flagship products, ALLDATA Repair® and ALLDATA Collision®, feature a factory-direct database of more than 38,000 engine-specific vehicles – 95% of all vehicles on the road today. ALLDATA Repair is the go-to source for comprehensive, factory-correct mechanical information for the automotive industry, and it includes expert repair technician support in ALLDATA® CommunitySM. ALLDATA Collision is the single source of OEM collision repair information, delivering unedited and regularly updated information for structural repairs, mechanical, and diagnostic information. ALLDATA DiagnosticsTM turns a tablet into an affordable, professional scan tool with the power of ALLDATA built in and unlimited scans – no per-scan charge. ALLDATA Collision Advantage bundles ALLDATA Collision with Estimate Integration to deliver OE-accurate estimates, including Vital repairs and OEM-required inspections and repairs. The ALLDATA Mobile® app, combined with a tablet, makes vehicle information and ALLDATA Repair available right at the vehicle to speed repairs. ALLDATA Manage® Online is a comprehensive shop management system that offers anytime, anywhere access to create quotes and invoices, electronically order parts, manage bays and technicians and track shop profitability. ALLDATA Tech-Assist® provides one-on-one assistance by phone from ASE Certified Master Technicians to help diagnose and solve tough repairs. ALLDATA® Training GarageSM is an online training resource with technical and business courses for shop staff and automotive students at all levels. Visit www.alldata.com for more information. During the quarter ended August 25, 2018, AutoZone opened 78 new stores and relocated four stores in the U.S., opened 28 new stores in Mexico and four in Brazil. As of August 25, 2018, the Company had 5,618 stores in 50 states in the U.S., the District of Columbia and Puerto Rico, 564 stores in Mexico and 20 stores in Brazil for a total count of 6,202.